Part 1 Introductory issues: Satiation, satiety: Concepts and organization of behaviour; Quantifying satiation and satiety. Part 2 Biological factors: Peripheral mechanisms of satiation and satiety control; Genetics of satiety; Metabolism and satiety. Part 3 Food composition factors: Impact of energy density and portion size on satiation and satiety; Protein and satiety; Fats and satiety; Carbohydrates and satiety; Satiation, satiety: The puzzle of solids and liquids; Functional foods, satiation and satiety. Part 4 Hedonic, cultural and environmental factors: Hedonics, satiation and satiety; Satiation, satiety and the daily intake pattern; Sensory specific satiation and satiety. Part 5 Public health implications: The low satiety phenotype; Satiation and satiety in obesity; Bringing satiety to the market through commercial foods: Technology, product development and claims; Consumer understanding of satiation and satiety and related health claims; How important are satiation and satiety for weight regulation? The control of eating: Is there any function for satiation and satiety? With growing concerns about the rising incidence of obesity, there is interest in understanding how the human appetite contributes to energy balance and how it might be affected by the foods we consume, as well as other cultural and environmental factors. 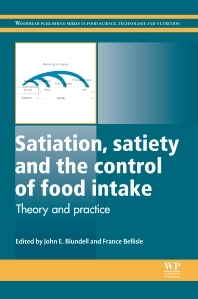 Satiation, satiety and the control of food intake provides a concise and authoritative overview of these areas. Part one introduces the concepts of satiation and satiety and discusses how these concepts can be quantified. Chapters in part two focus on biological factors of satiation and satiety before part three moves on to explore food composition factors. Chapters in part four discuss hedonic, cultural and environmental factors of satiation and satiety. Finally, part five explores public health implications and evaluates consumer understanding of satiation and satiety and related health claims. France Bellisle is a Director of Reserach at the Centre de Recherche en Nutrition Humaine (CRNH), University of Paris 13, Bobigny, France.